Mustards can be very confusing at first sight but, with a little perseverance, most of them can be readily distinguished. Leaves are one important feature, these vary a great deal from one species to another. 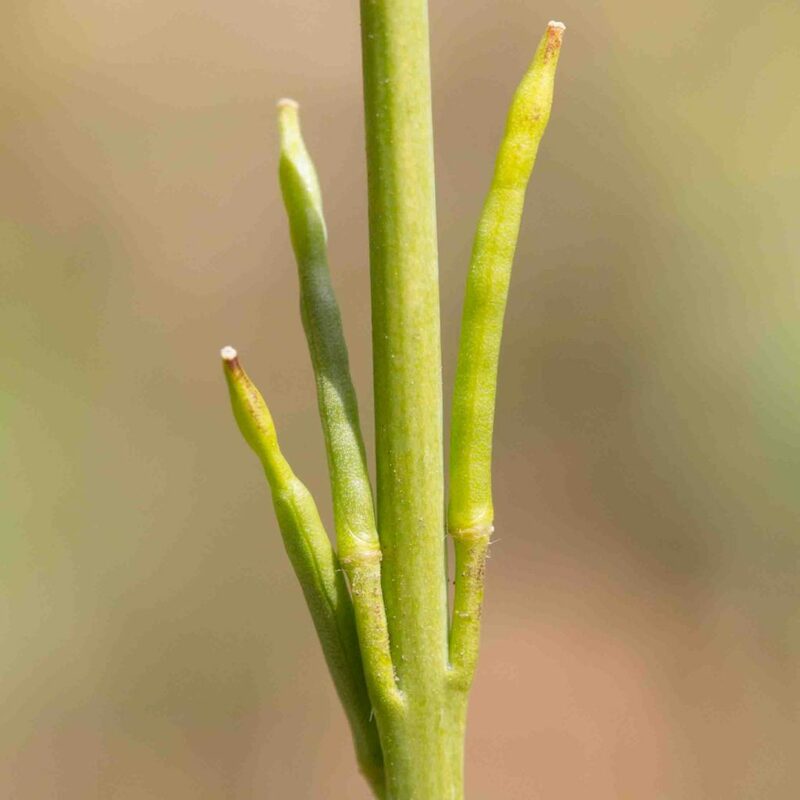 Fruits are the other, some are cylindric, others tapered towards the tip, some are appressed to the stem, others are spreading and either ascending (upwards-curving) or reflexed (down-curving). All of the fruits are “dehiscent” meaning that they split longitudinally down a seam. 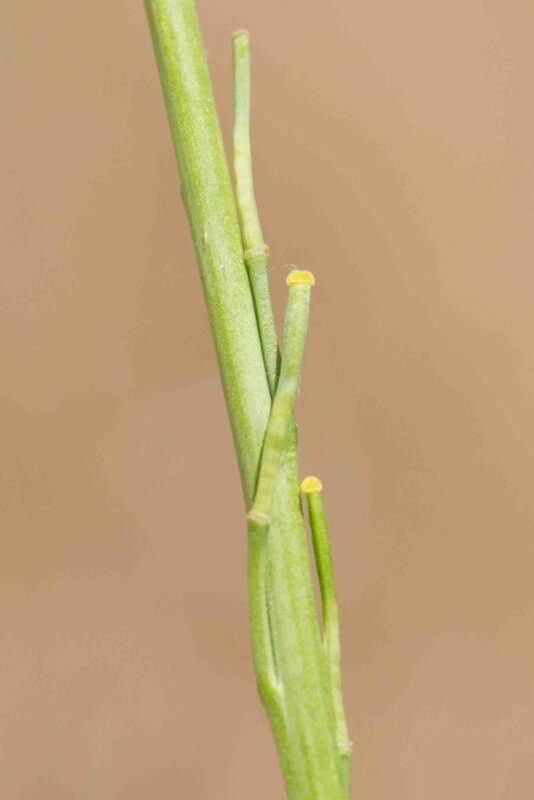 The fruits of Brassica and Hirschfeldia are segmented with a clearly defined terminal segment. 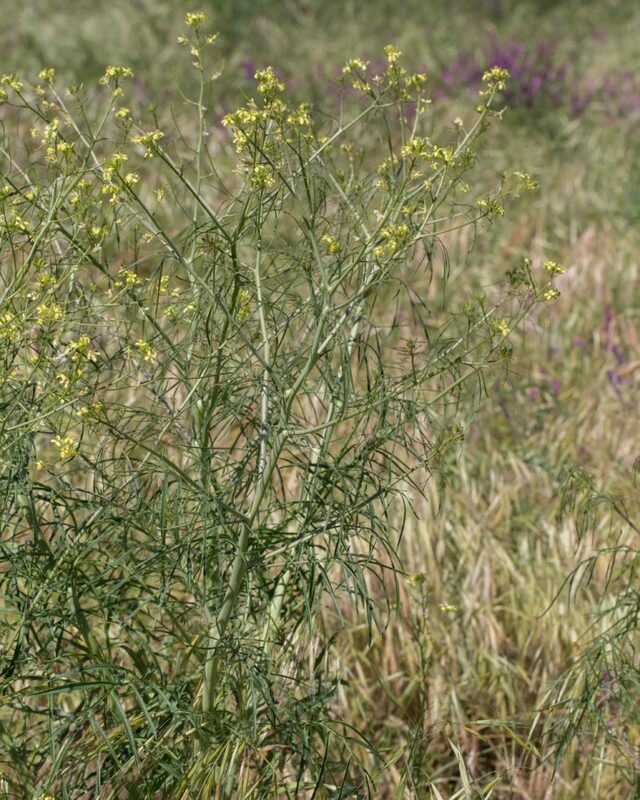 Sisymbrium fruits are not segmented. 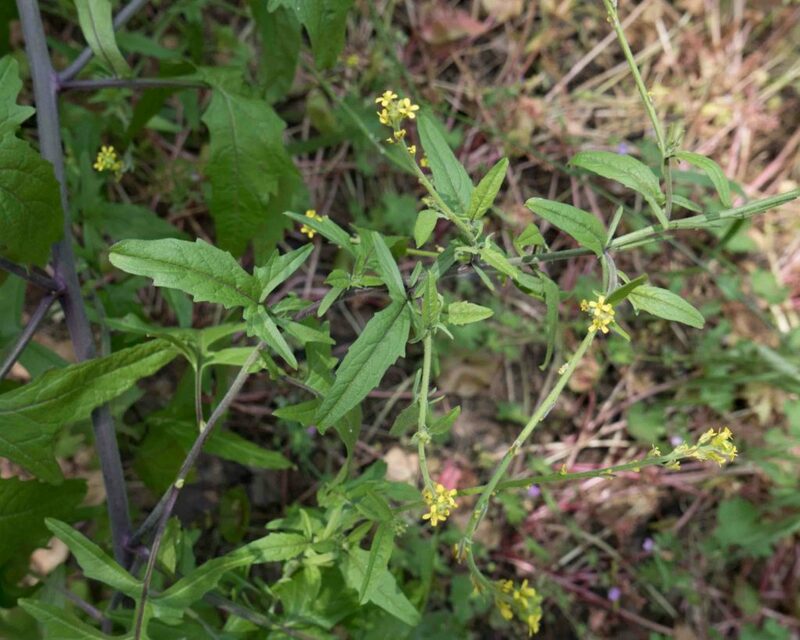 Common but easily confused with Summer Mustard (Hirschfeldia incana). 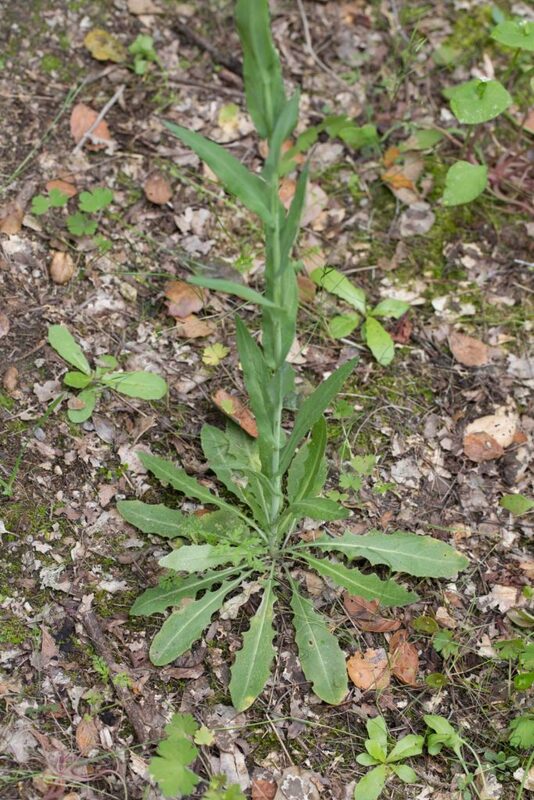 Both have variable leaves, all petioled, the lower coarse, pinnately lobed and more or less toothed, the upper cauline leaves smaller. 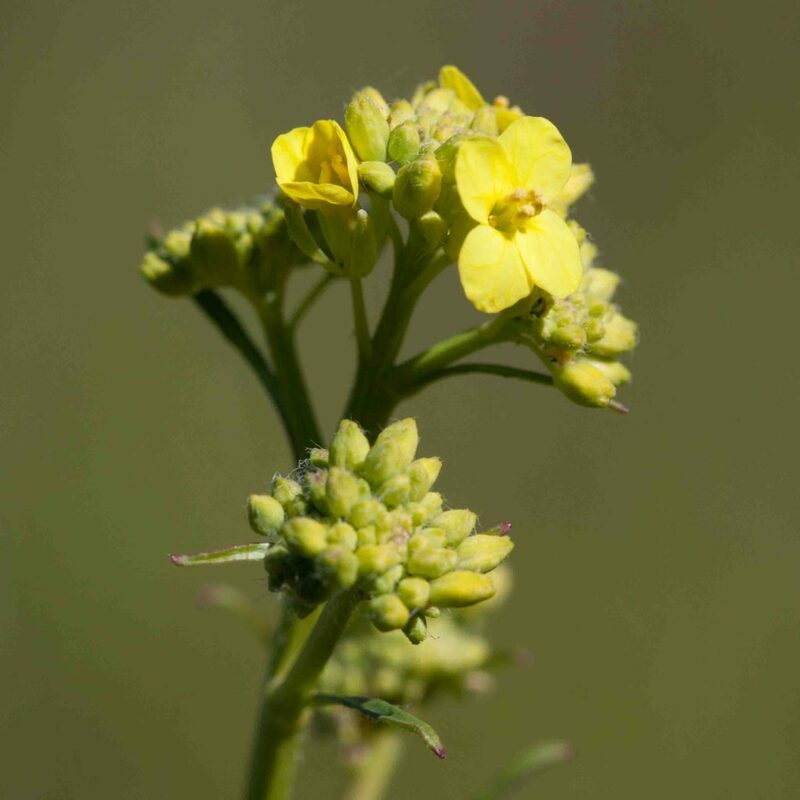 Black Mustard has slightly larger flowers but the difference is not enough to notice in the field. 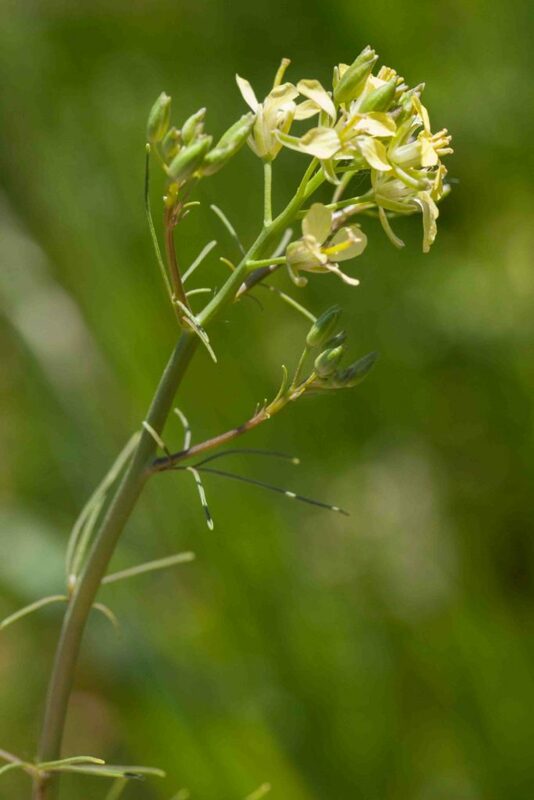 The main differences are that the base of the Summer Mustard is hairy whereas the stem of Black Mustard is hairy only higher up and, more significant, that the terminal sections of the fruits (both of which are appressed to the stem) are different. 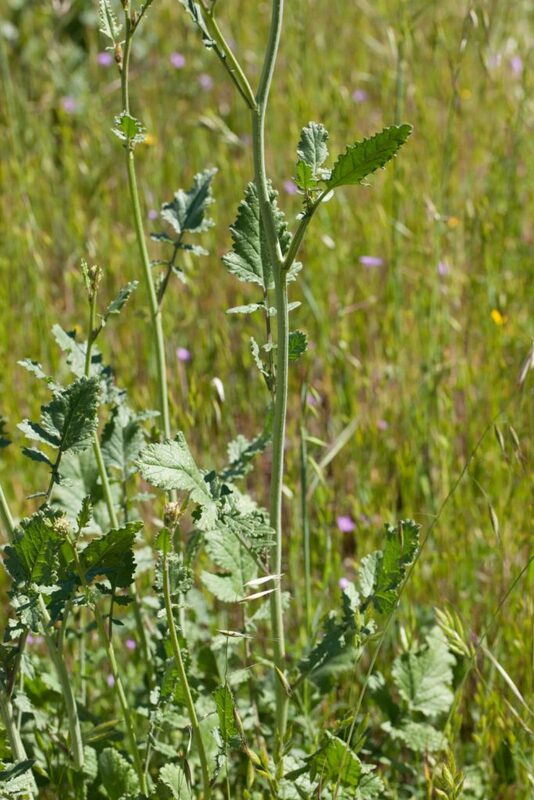 Black Mustard’s fruits have a smooth, cylindric terminal section whereas Summer Mustard’s are constricted just below an expanded tip. 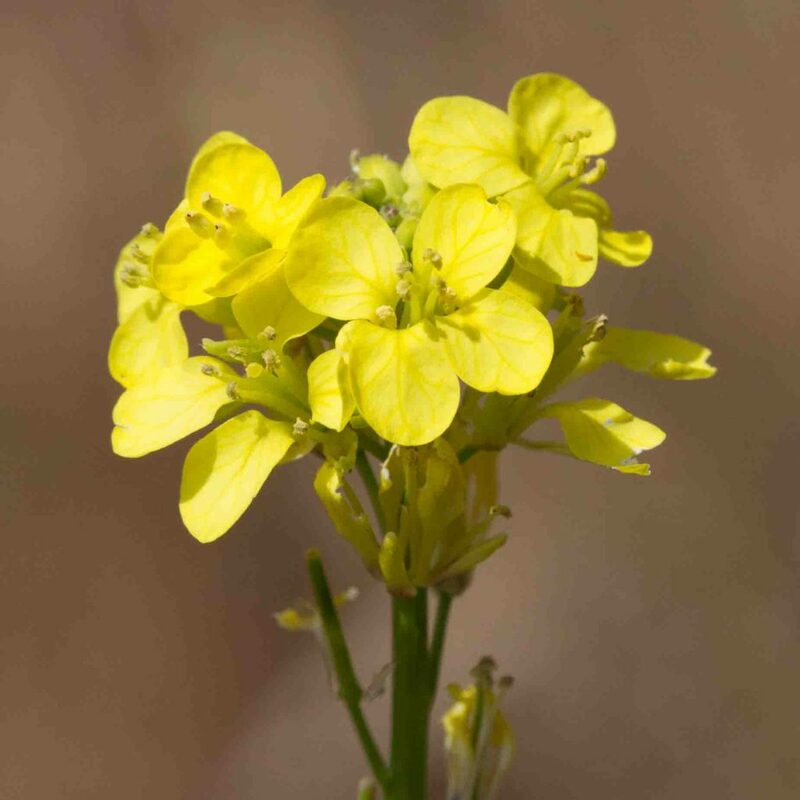 Common but easily confused with Black Mustard (Brassica nigra). See above for a description of the differences. 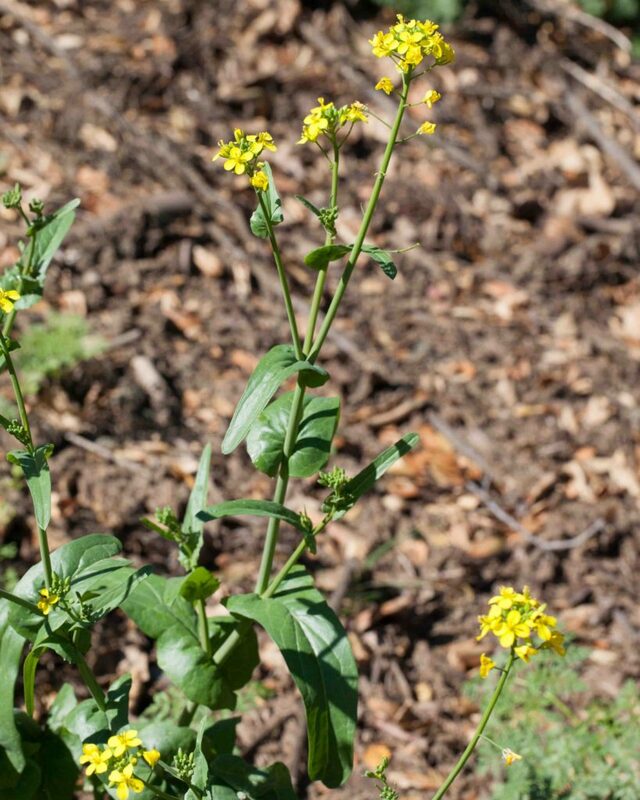 An earlier bloomer than the other mustards and even more invasive. 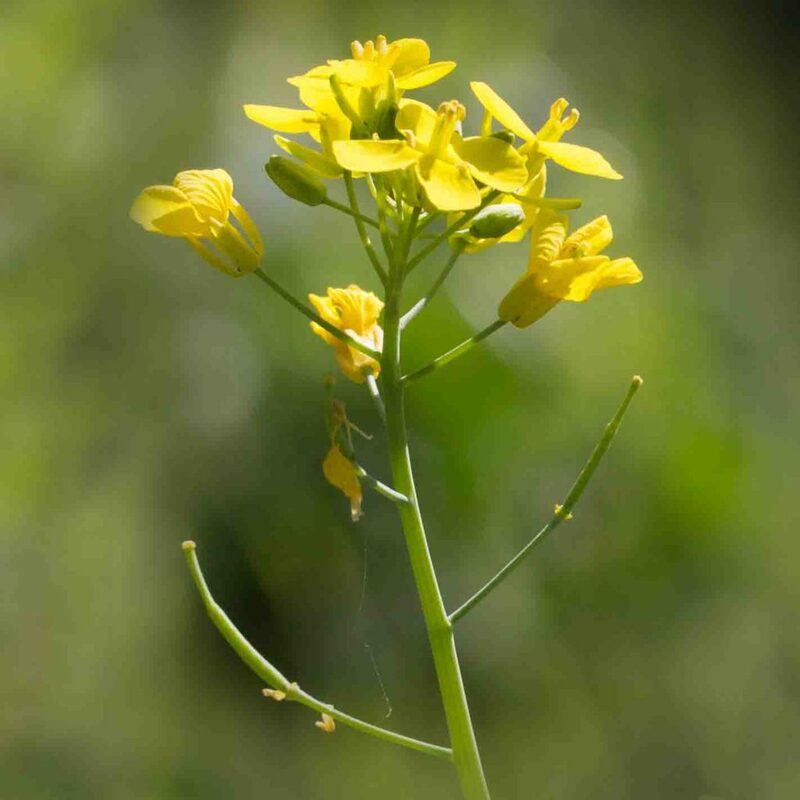 In quantities it has a denser inflorescence and a brighter yellow color than Black Mustard (Brassica nigra). 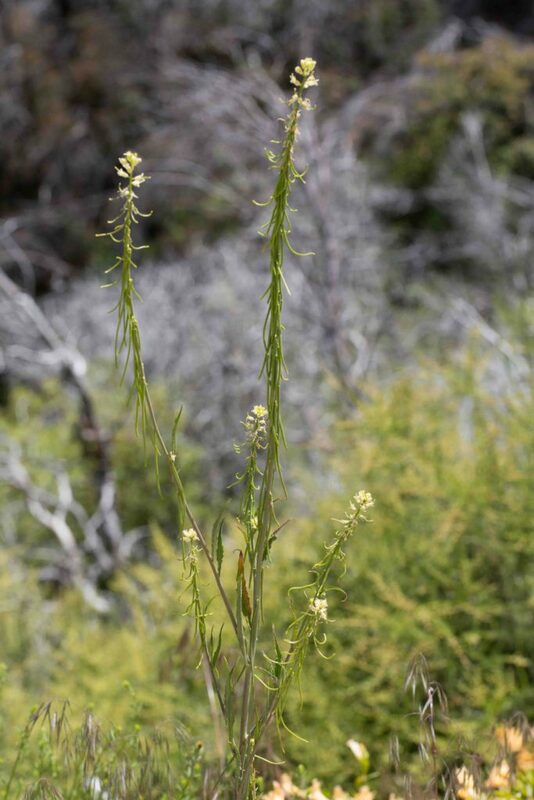 A more objective difference lies in the leaves which are glabrous and clasping at the base. 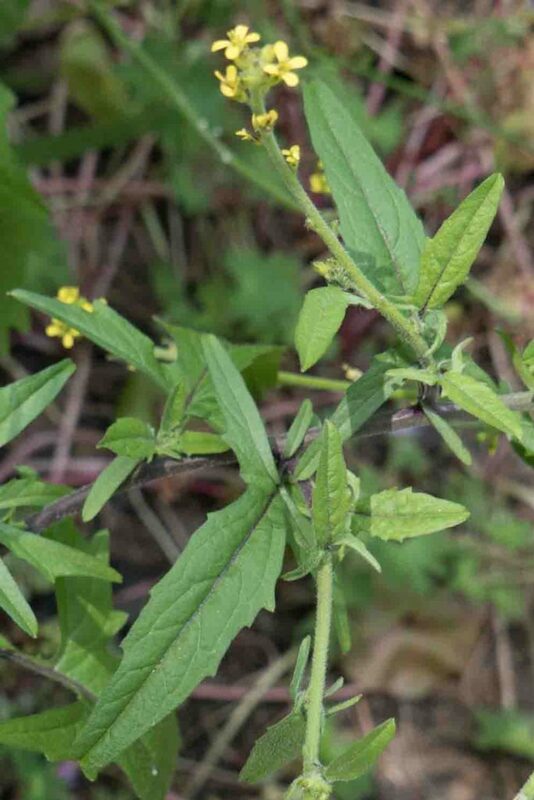 The lower leaves can be pinnately lobed wth the terminal leaflet being the largest. 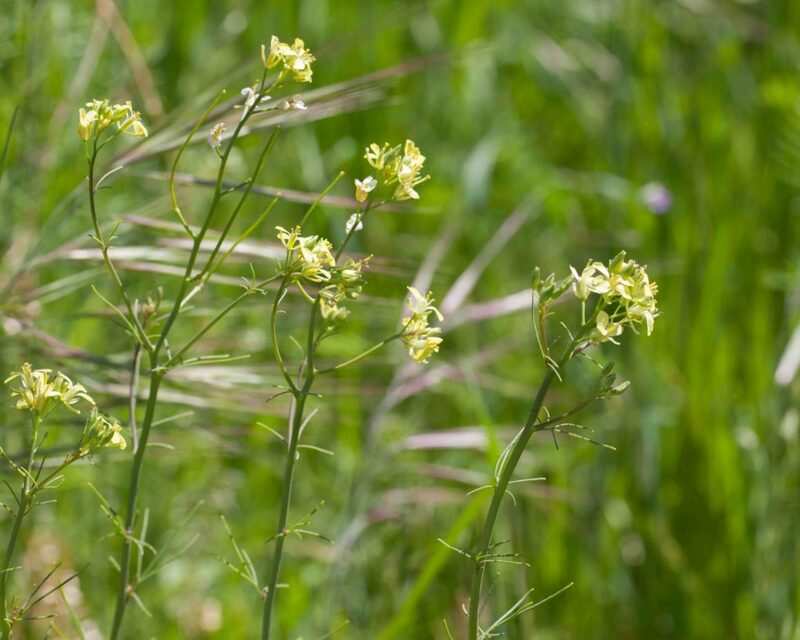 This and Black Mustard are also clearly distinguished by their fruits. 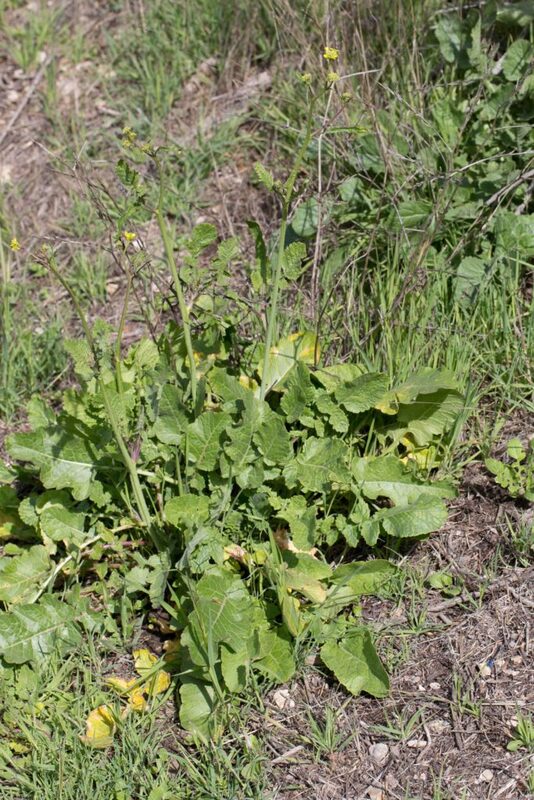 Field Mustard has fruits that are spreading to ascending and noticeably tapered toward the tip like the fruits of Wild Radish (Raphanus sativus). 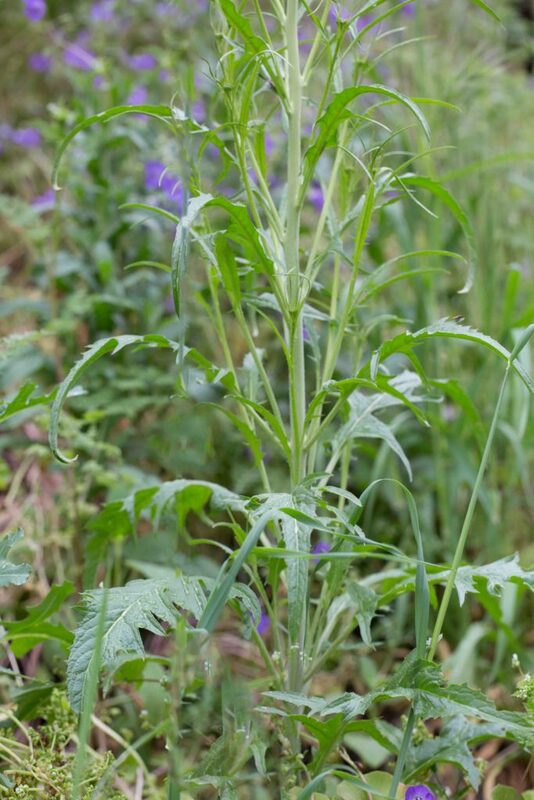 A leafy mustard, leaves being lanceolate to oblong, pinnately lobed or toothed. 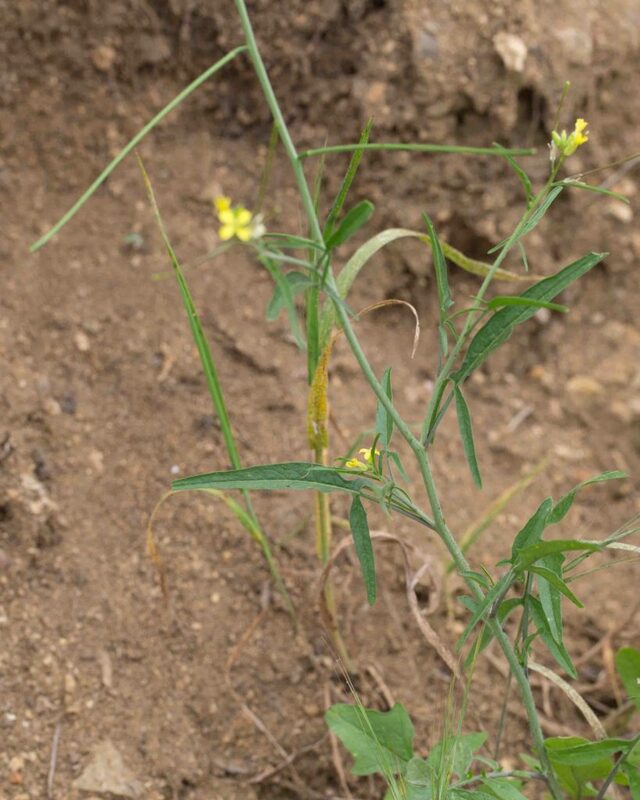 Like Tower Mustard (Turritis glabra), it has white to creamy white flowers. 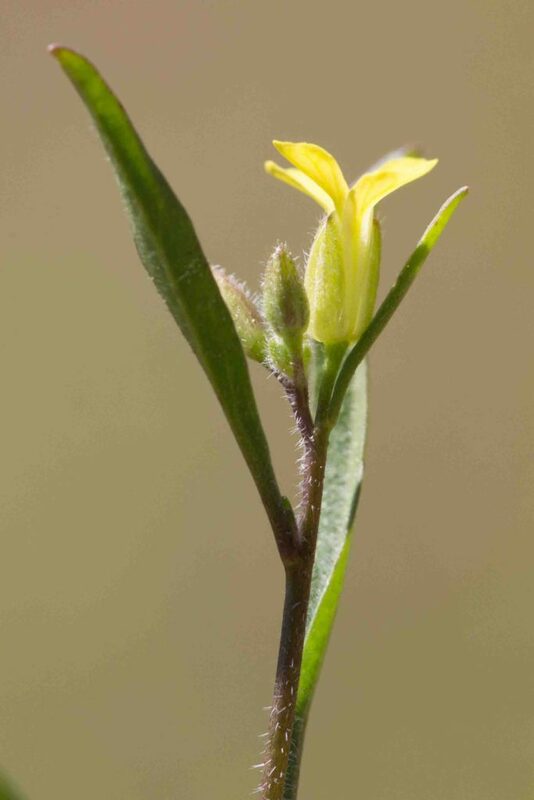 The calyx is cylindric with greenish sepals. 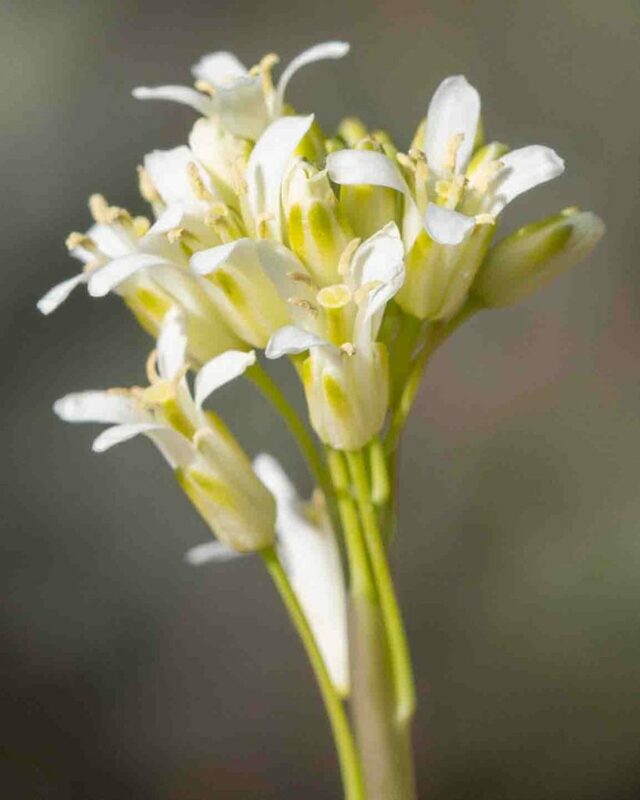 There are 4 long and 2 short stamens. 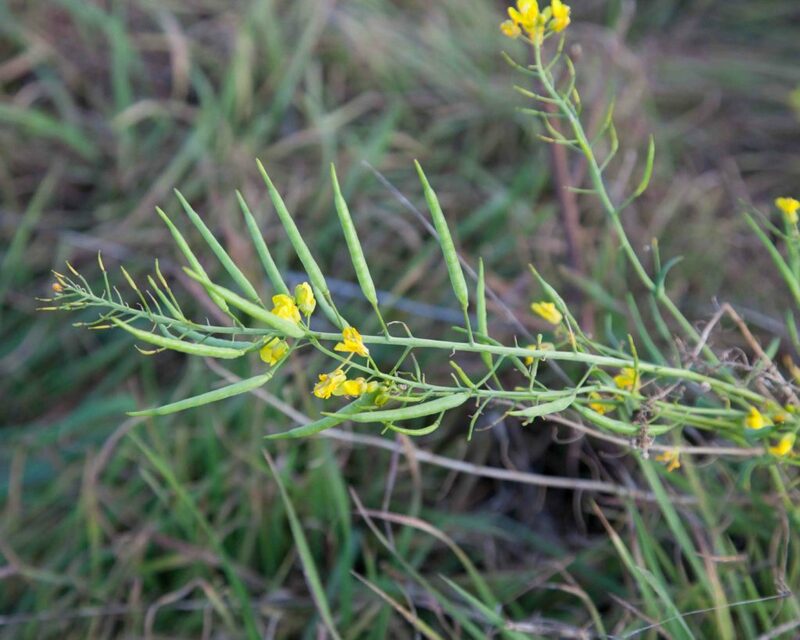 The cylindric fruits are erect to reflexed, straight to outcurved, unlike Tower Mustard’s which are consistently erect and more or less appressed. 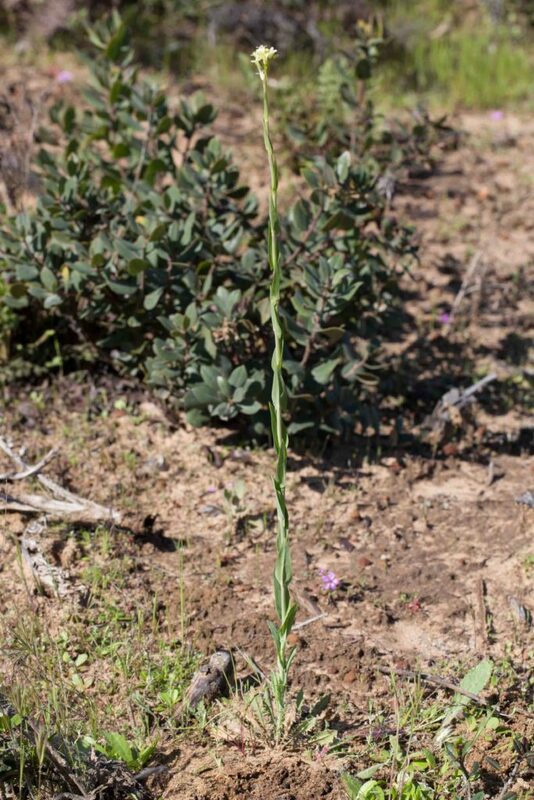 A tall, slender plant with a single stem. 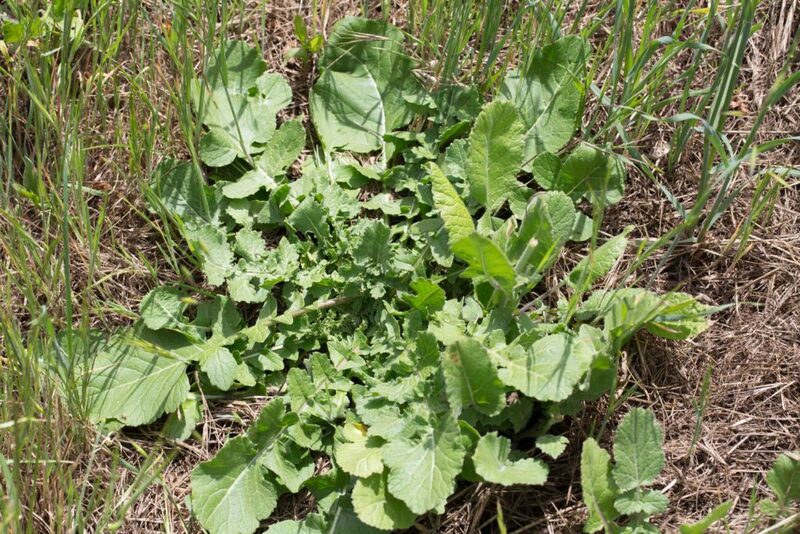 There is a rosette of basal leaves, oblong to oblanceolate, slightly toothed or lobed. 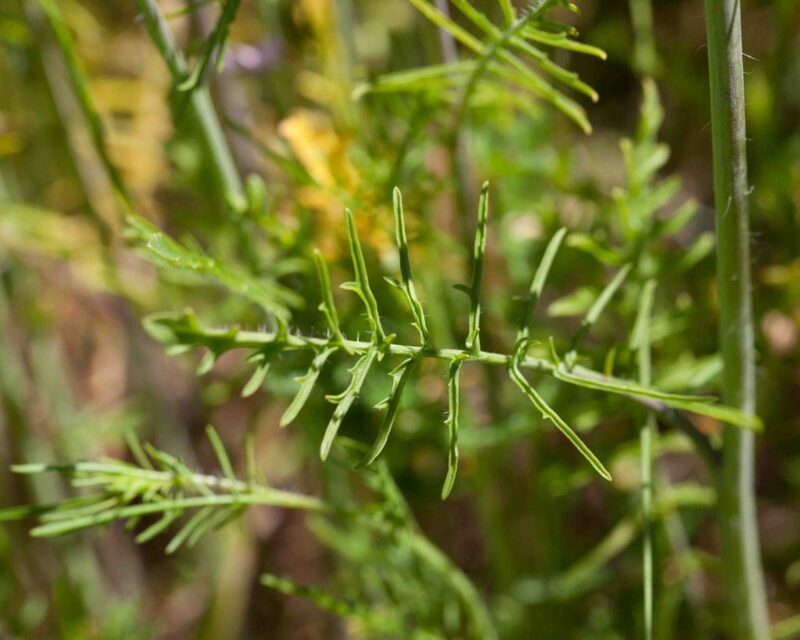 Cauline leaves are alternate, with arrow-shaped or clasping bases. 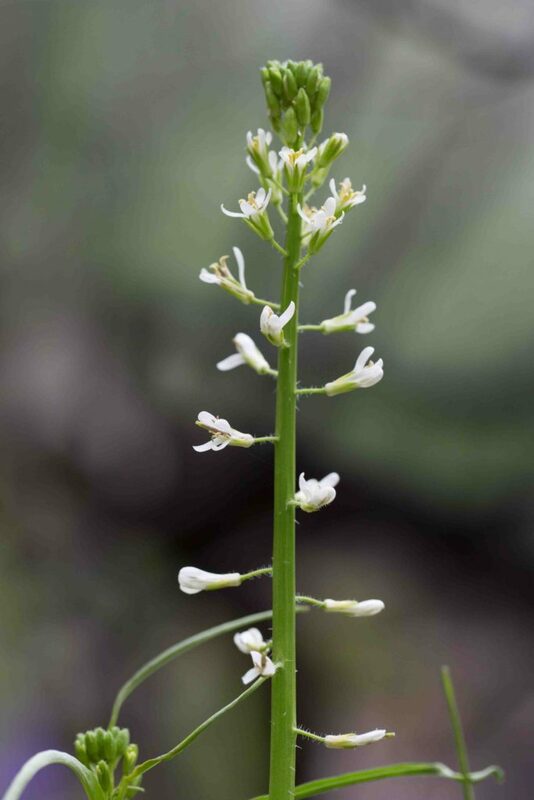 Small white flowers with cream-colored sepals are clustered towards the top of the stem. Fruits are erect and more or less appressed. 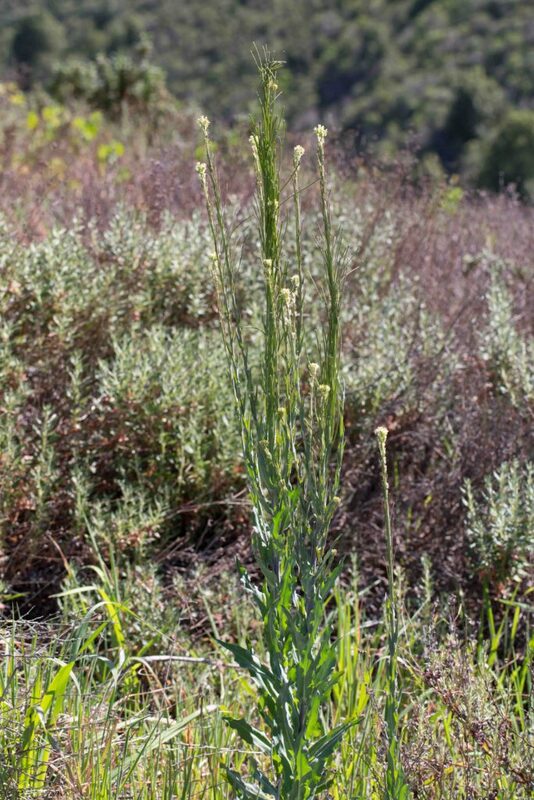 The plant is glaucous (covered in a white, waxy substance) above the base. 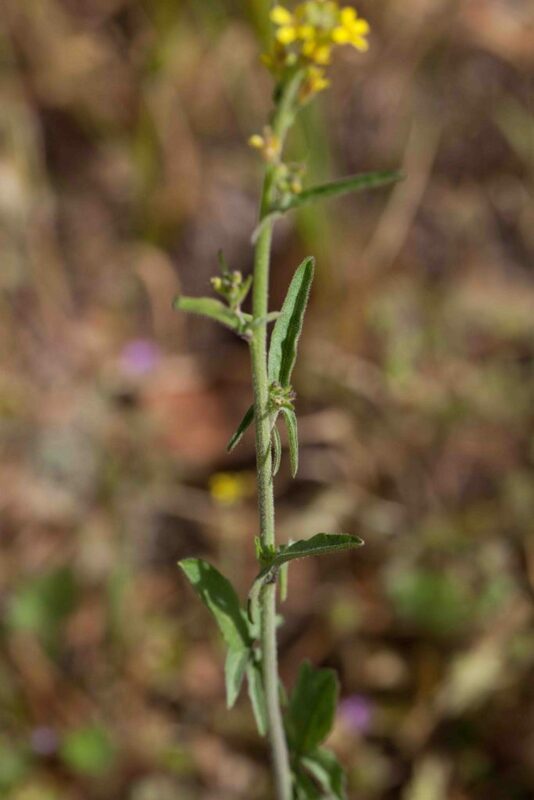 A relatively uncommon mustard, but one that is easily recognized by its slender, linear to thread-like, pinnately lobed leaves. 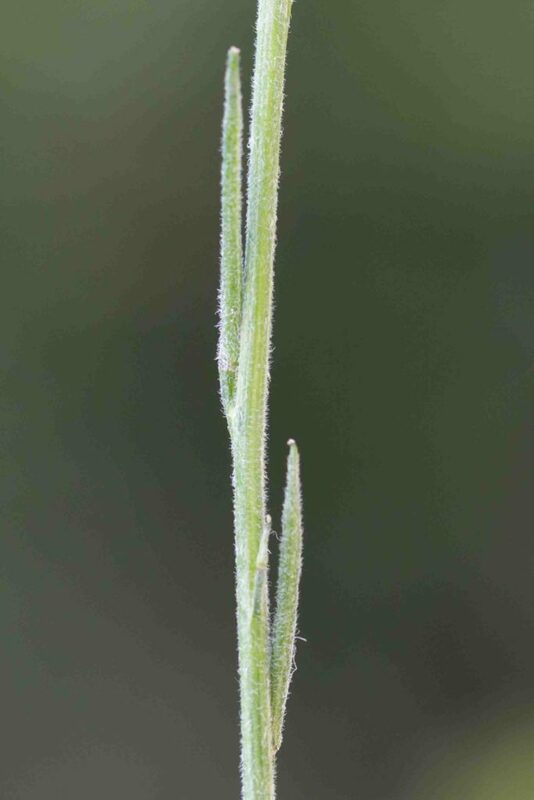 Fruits are slender cylindric siliques on spreading to ascending pedicels. 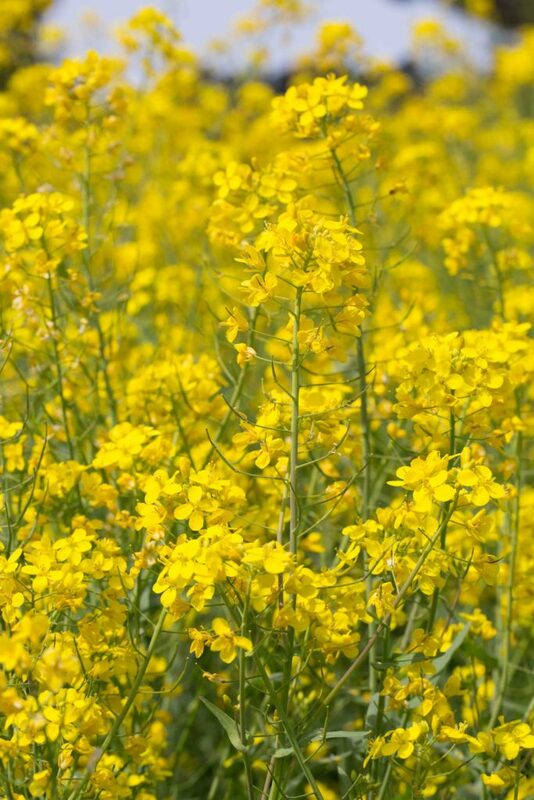 Flowers are a paler yellow than some other mustards. 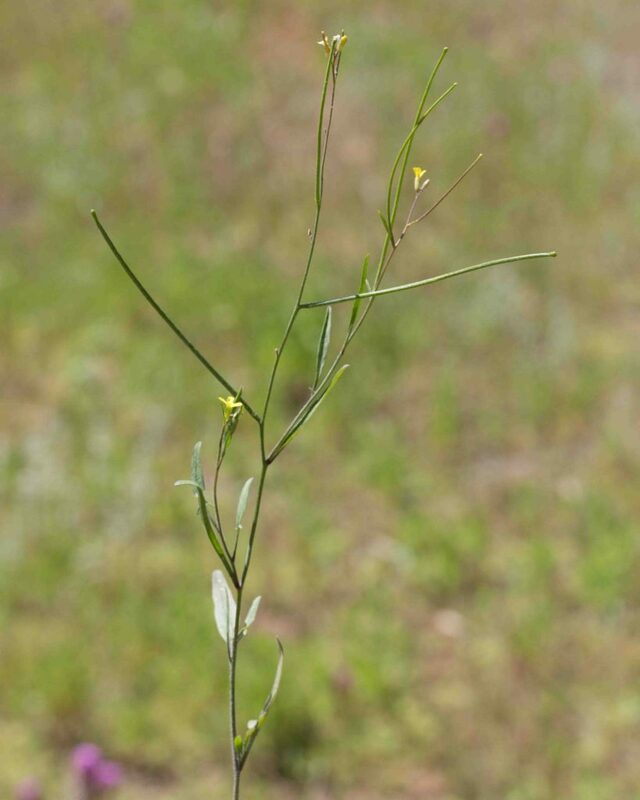 More common than Tumble Mustard (Sisymbrium altissimum), this is most easily recognized by its leaves, more or less oblanceolate with a single pair of smaller, backward facing lobes at the base of each leaf. The fruits are very different also, ascending, closely appressed to the stem and awl-shaped. Note the lack of a separate terminal segment. 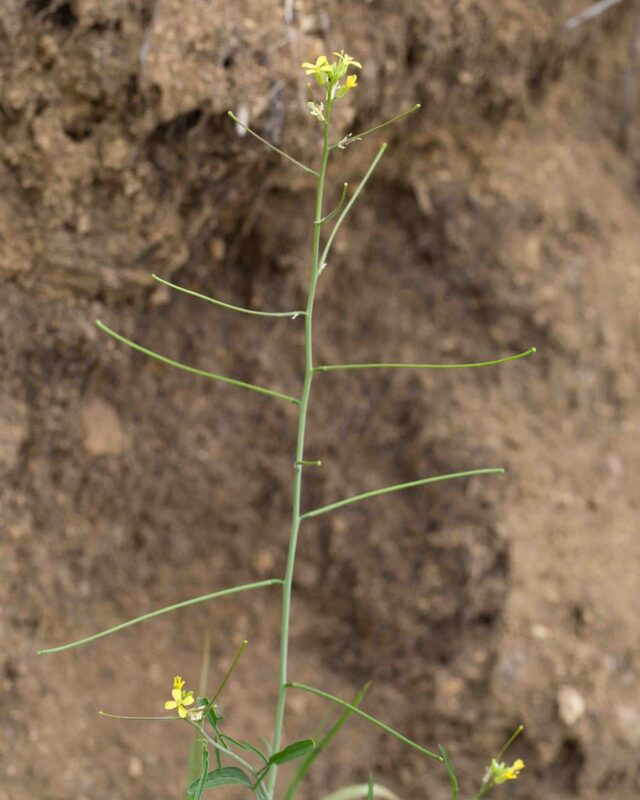 Relatively uncommon in Monterey County, this is similar to Tumble Mustard (Sisymbrium altissimum), but with the upper leaves hastate (arrow-shaped), simple, narrowly lanceolate to linear with the lobes at the base of the leaf much narrower than those of Hedge Mustard (Sisymbrium offiicinale) and extended more outwards at right angles than backwards. 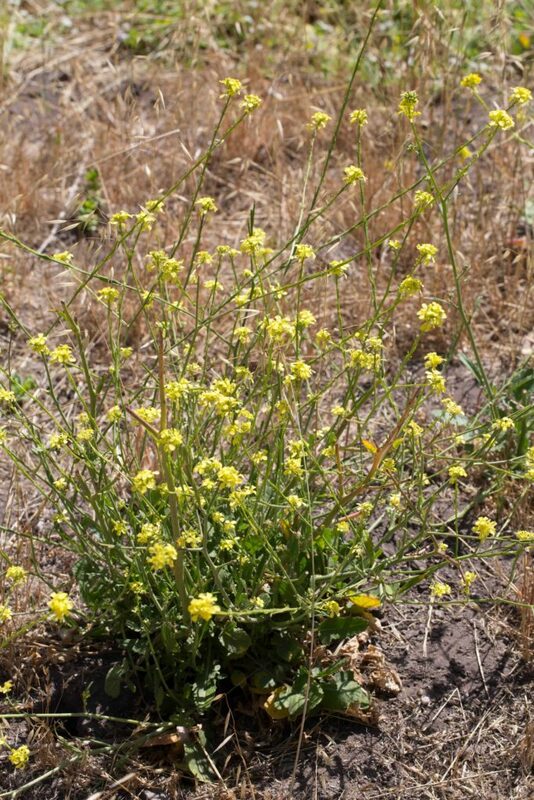 Fruits are similar to those of Tumble Mustard but spreading almost horizontally from the stem.